Clean drinking Water for Kisumu Citizens! Together with your help, we like to build an example project in Kisumu to serve the Community with clean drinking Water to affordable prices! Please take your time and check out our Crowdfunding project on Indiegogo.com. What are the real problems in our World? an email with a delay of 3 Minutes? NO! an internet brackdown for 30 Minutes? NO! I'm asking you, are these serious problems or is the western World to much spoiled from there Wealth that they miss out on the real issues we still have in this World. No access to clean drinking Water? Thats a real problem! I was born in Switzerland, 47 Years old, IT Consultant and Businessman and I'm living since 6 Years here in Kenya. In Switzerland I was "naturaly" used to a perfect infrastructure offered by the Government. I had to learn that this is not the norm and other places on this Earth have big problems with basic needs. 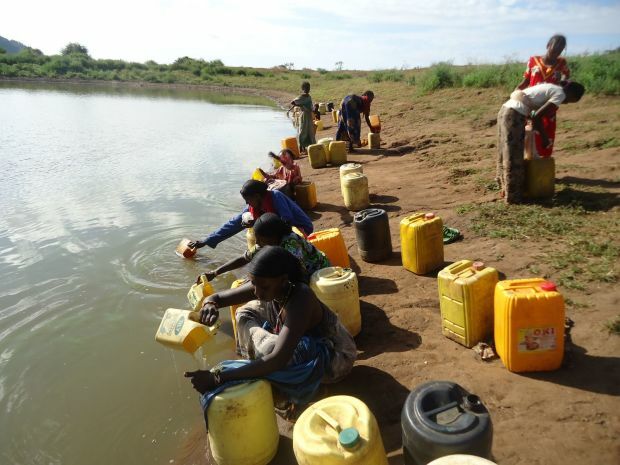 Here in Kenya, Families are dealing with the most basic needs - DRINKING WATER for there Family. 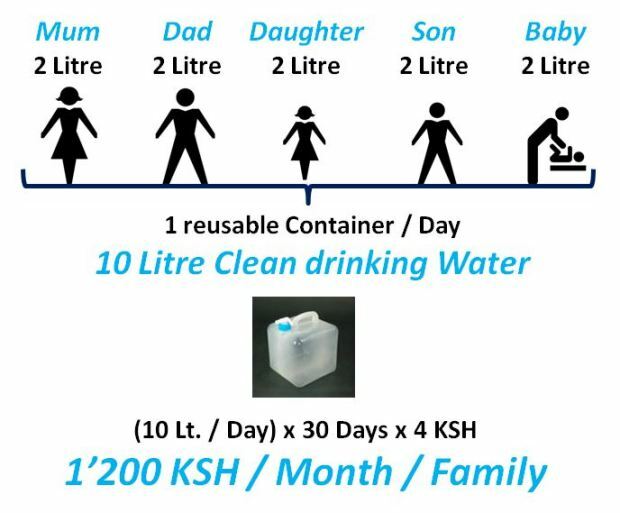 We like to help the Families in Kisumu Kenya to get a minimum of healthy and clean drinking Water to an affordable fair price! What is the main Problem! 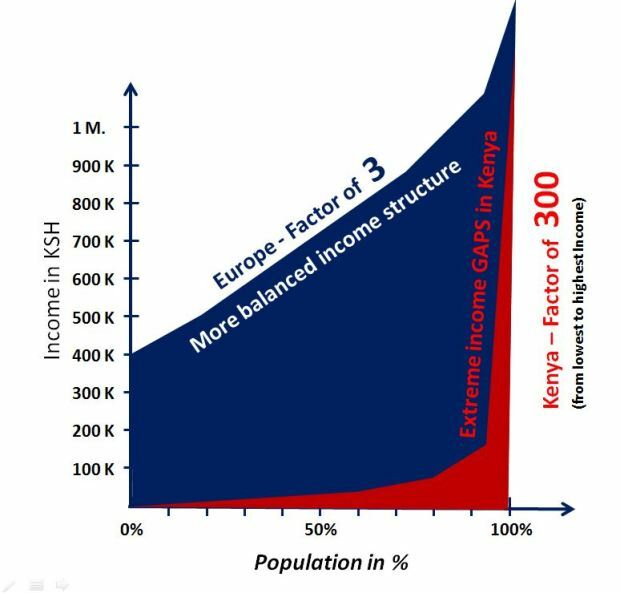 When you compare the income structures from Europe with Countries like Kenya, you will recognize the real issues we have! The extrem Gap in the salary structure makes it simply impossible, that a normal Family can use the Money they have to buy bottled Water in the Supermarket. It is far to expensive and only accessable for a small group of top earners! 70% have NO access to clean drinking Water! 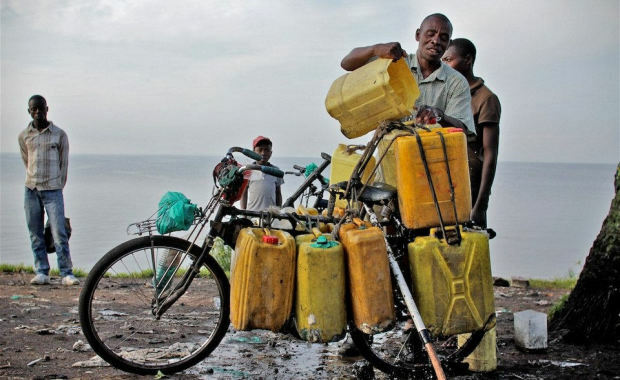 In places like Kisumu, 70% of the population has to drink dirthy and poisonous Water from Lake Victoria or little streams with Water, while clean Water is not affordable to them. It makes them sick und nobody cares about it! IT IS MY WISH TO CHANGE THIS FOR A BETTER WORLD! ARE YOU WITH ME? 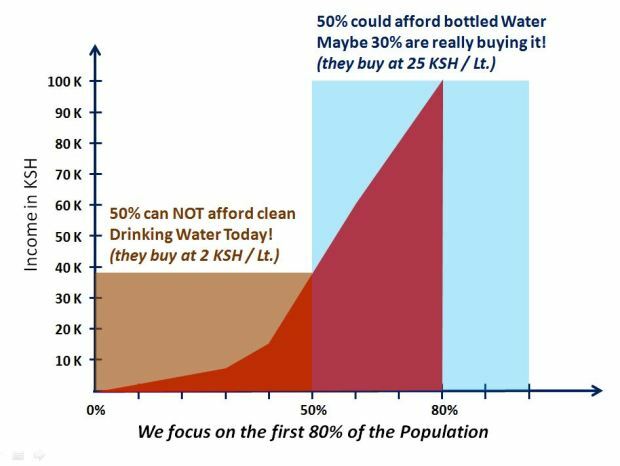 Together with my Swiss Friend in Kenya, we decided to initiate the project to help solving this problem in a sustainable way. 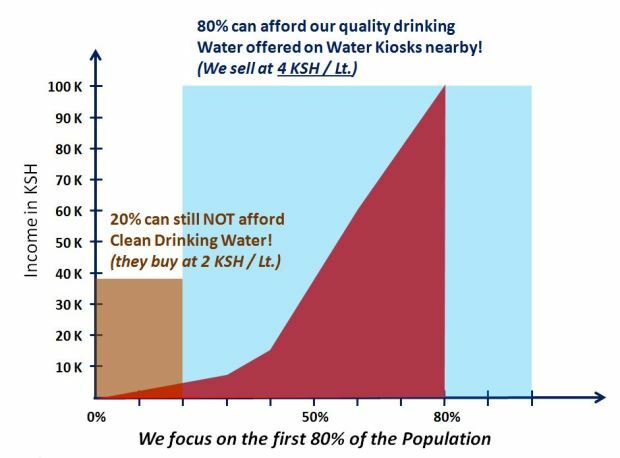 Clean drinking water is today in Kisumu only accessable and affordable for the upper midle class and the upper class. More than 50% of the County Water supply is used by only 15% of the population. We like to build up a distribution channel for quality drinking water to the Community for 4 KSH / Litre. The Community gets access to the Water on Water Kiosks with there own cannes. We only run the central Water Production centre. The Water Kiosks, the distribution and the sales channel is done by selfemployeed partners. This creates new jobs for the community. We developed a business model to build up decentralized Water treatment plants. Dezentralisation is helping us to cut down costs for transport. This makes our Water more affordable and more accessible to the community. We hope to install with your help until January 2016 the first plant and produce up to 10'000 Litres of clean drinking water every Day. When we reach 70% of sales, we will order the second machine to double the production to 20'000 Litres per Day. And we go on and on and on like this!!! We use a quality technology from Trunz Water Systems AG in Switzerland. We allready identified the location for the first Water production centre. 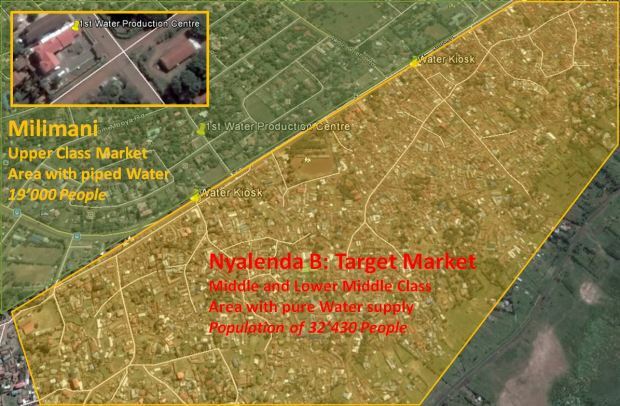 It is on a perfect location, save for the equipment and very close to our first target Market, The Nyalenda B Estate with a population of approx. 32'430 People can be served within a distance of less than 300 Meter. The location has allready the needed roh Water supply tanks, standby Generator and enough space to supply the Water to Lorries with Water tanks. Why and for what we need your Help! We try at the moment to fund the project out of privat sources. The fund raising here on gofundme.com is an additional way to fund our project to start in a shorter period of time and in a bigger scale. All the internal costs for salaries, traveling, accomodation, planning and integration of the phase 1 of our project is financed by us. For the customers we need to buy a first lot of Water Containers with capacities of 10 Litre, 15 Litre and 20 Litre. It is our target to execute the Phase 1 of the project anyway. We will also try other crowdfunding sites to speed and scale up the project. People in Kisumu are suffering about that Water issue. Please help us to solve this problem together.